Which female player turned pro when she was fourteen and then finished the next year ranked in the top twenty? 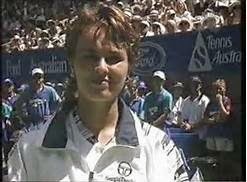 Martina Hingis. She still holds some of the youngest-to-do-this-and-that records and she also held Number One for about four years.